Don Dark: So who's the dame? Mark Binney: Who said there was a dame? Don Dark: There's always a dame. After premiering in the mid-1980s on PBS and BBC, Dennis Potter's The Singing Detective faded into obscurity but for a faithful legion of fans who tuned in to the miniseries night after night to see the adventures of pulp author Dan Dark. Potter also wrote a screenplay in 1992 in an effort to bring his character to a much larger audience. However, Dennis Potter died two years later, leaving his script in the hands of accomplished director Keith Gordon (Waking the Dead) and producer Mel Gibson, who also has a small part in an almost unrecognizable makeup job. Gibson and Gordon found their Dan Dark in Robert Downey Jr., and the end result is one of the most enjoyably quirky films you are likely to find. In this feature version, Dan Dark (Downey Jr.) is a pulp fiction author who, after having written numerous books, finds himself in a hospital suffering from a debilitating skin condition (the same that Potter suffered from) and, from the outset, it is clear that Dark is slowly losing his mind. As his days go by in the hospital, Dark slowly recovers, but the massive amount of drugs he has ingested during his treatment begin to warp his mind. He drifts in and out of a dreamscape featuring moments from his first novel, "The Singing Detective". As a private detective who sings when he is not solving unsolvable cases, he begins to place the people he meets at the hospital in his dreams, including his ex-wife (Wright-Penn), a pretty nurse (Holmes), and a psychiatrist (Gibson) who helps Dark piece together both his life and his mind. The Singing Detective has a number of factors that all contribute to it being simply one of the best films in recent release. The first is Gordon's vision for the three parallel stories occurring, whether it's a musical number, situations in the hospital, or events in the world of Dark's novel. The hospital scenes are shot with a very bright, overexposed look in which whites are almost blinding at times, while the noir sequences are moody and offer very dark imagery, including one scene at the start of the film that is lit with a single light and instantly evokes atmosphere. While Gordon does a fine job of creating atmosphere in nearly every shot, it is Potter's creation that helps to move the story along. I enjoyed that the musical numbers are lip-synched as this presents a much more surreal and dreamlike mood. There were a few changes from Potter's original miniseries on the way to the film adaptation, including location (an American metropolis for London), and the songs from the '30s and '40s replaced with 1950s hits including Lets Go To The Hop and Mr. Sandman. Potter had a sort of absurd and satiric outlook, and several points in the script are often beautifully captured as moments inside Dark's brain are brought together with moments in the real world with a sort of irony that is both comedic and touching. The cast is note-perfect (no pun intended) as Downey gives what is quite possibly the best performance of his career. His dual-layered work here is another example that proves Downey, despite all of his personal problems, is one of the best and brightest actors working today; this is his film, and he more than competently shoulders the load. In supporting performances Gibson, Wright-Penn, Holmes, and Adrian Brody all do fine work and provide bright spots in a film filled with many. Image Transfer Review: Presented in a 2.35:1 anamorphic widescreen image, The Singing Detective boasts a very impressive image transfer. From the outset, the bright whites of the hospital provide terrific sharpness and detail with no grain, while the darker noir scenes provide nice depth throughout. Some sequences show a slight amount of grain, but this is more than likely a stylistic choice by Gordon. Overall, this is a very nice transfer. Audio Transfer Review: The Dolby Digital 5.1 mix is far from being overly kinetic but it certainly gets the job done, especially during the musical numbers. Dialogue is crisp and clear with no distortion, though Dark's mumblings sometimes forced me to back the disc up and listen again. Overall, this is a very nice mix that has a few stand-out moments. Extras Review: A commentary track by Keith Gordon is the lone extra feature provided and, for the most part, it is a very entertaining track. Gordon talks at length about Potter's original vision and how he tried to remain faithful to it while also working with a relatively small budget. He also discusses the way in which the script bounced all over Hollywood before falling into his lap—can you imagine Barry Levinson directing and Dustin Hoffman as Dark? Gordon keeps things moving and the track is certainly worth a listen. In many ways, The Singing Detective was doomed from the start in terms of box office performance as it lacks the incentives for the "under 20" crowd. 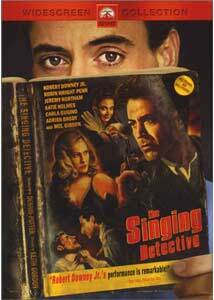 This is a shame, as The Singing Detective is surreal entertainment at its finest. This release offers that audience another chance to appreciate it.